Happy Friday dolls! Hope everyone had a fabulous week. Mine was pretty chill... literally! 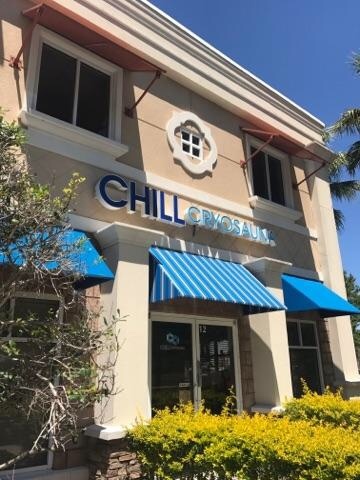 If you follow me on Instagram or Snapchat you might have already saw that Kerri and I went and froze our little booties off, quite literally, at Chill Cryosauna. 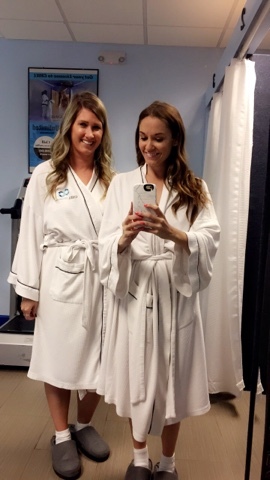 I had been interested in cryotherapy for awhile and after doing some reading and investigating about it I decided to give it a try and luckily Kerri was interested too! We actually did our first session about a month ago but I'm a genius and forgot my memory card in my camera so when we did our second I decided to document it and I figured today I'd share my experience (and a little more about cryotherapy) with you for anyone who was interested! So let's start with what cryotherapy is. Cryotherapy exposes you to subzero temperatures in an effort to relieve pain and improve health. How cold is subzero? About -200 degrees Fahrenheit to be exact. Now I'm sure you're probably thinking "who in their right mind would want to subject themselves to temperatures that cold?!? ", right? Well, I promise you I'm not crazy. I live in Florida so obviously I HATE the cold but I will say, I am obsessed with cryotherapy. It's crazy how energized and revived you feel after just one 3 minute session. 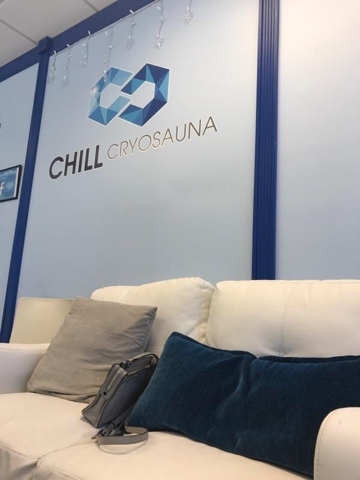 Any muscle soreness you had going into the session will either be subsided or completely relieved, it's said to burn more calories than spending an hour running, your sleep is improved, your immune system is boosted and these are just a few of the reported benefits of cryotherapy. Ok, now on to what to expect...when you're expecting. Just kidding! 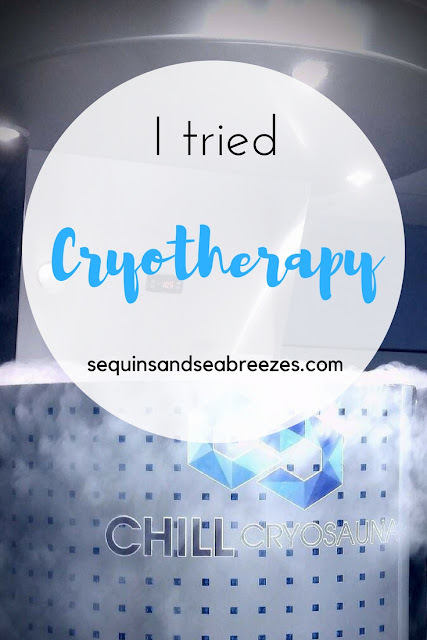 You should not do cryotherapy while you're pregnant or trying to get pregnant. Ok, now that I've gotten that PSA out of the way; when you show up for your cryo appointment you fill out some paperwork, confirm your blood pressure is in the acceptable range to participate in cryo and then they take you back to strip. Yup, cryo is done in your birthday suit friends. Well, you do put gloves and socks on but everything else is out there and exposed to the elements which I admit is a bit scary. Once you climb into the chamber you hand the employee your robe and they start the machine and it gets cold. Fast. The girl working the day we were there played music to try to distract us from just how cold it was and to help pass the time faster but no matter what you do, you're going to start trembling from the cold pretty quickly. We rotated 4 different times throughout the 3 minute session which in my opinion helped me from completely freezing and before you know it they're handing you your robe and you're done! One of the craziest things Kerri and I experienced was just how cold our skin stayed after the session. We went out for food and a drinks after and it felt like it took forever to warm back up despite it being in the 80's. 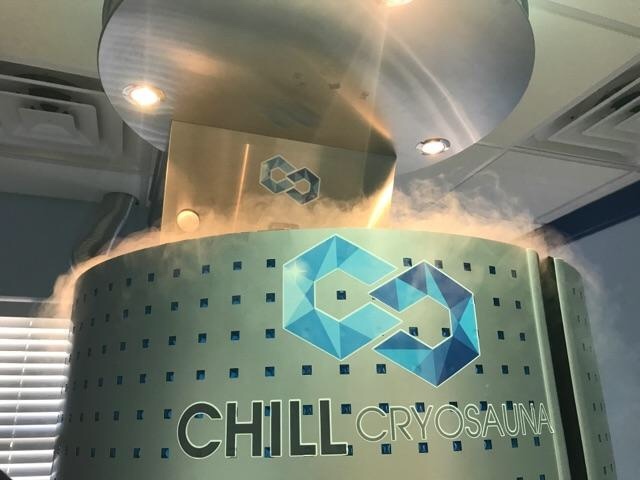 If you're on the fence about trying cryo, I'd definitely say to give it a try! Let me know if you've tried it and what you think or if you have any other questions about cryotherapy! So how did you feel after the treatment? Less achy, slept better etc? I've done some research on it before to see if it could help my rheumatoid arthritis. I have heard good things and bad things for RA from some people, so I am still not sure lol I know it can really help other issues though! I have definitely heard it has some really awesome benefits!! It's great to hear that you had a good experience! I might check it out!! Happy Friday dear! I really want to give this a shot sometime! Great review lady! 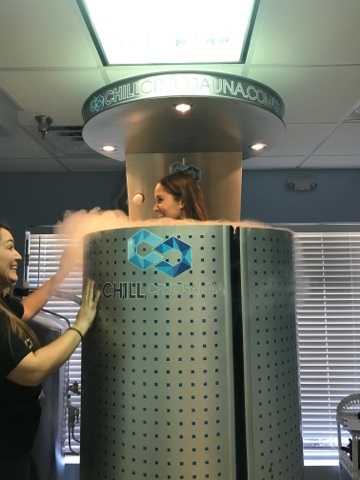 I have heard so much about the benefits of cryotherapy but didn't know exactly what it entailed: oh my gosh, that's cold! I would be willing to try it for muscle soreness and how awesome that it burns that many calories! Happy Friday! I really want to try this! I'll have to see if I can find one near here! Sign me up! Have a great weekend! I saw this on RHOBH! So cool that you tried and and that you liked it so much! It's amazing all of the things that it helps. I may have to try it out one day! I've been intrigued since seeing it on the Real Housewives! ha. It's good to know it actually works! And burns more calories than running?! Count me in! I really want to try this! I hate being cold but it sounds so interesting. I would love to try this! Thank you for the review and sharing it! Have a fab weekend. Wow that looks so amazing would love to give it a try. We have a cryno place in Wilmington that I've been wanting to try! I hate being cold so that will be interesting but I've heard so many great things about it! This sounds so cool (no pun intended). Thanks for sharing, this would be neat to look into. Oh my what will they come up with next! 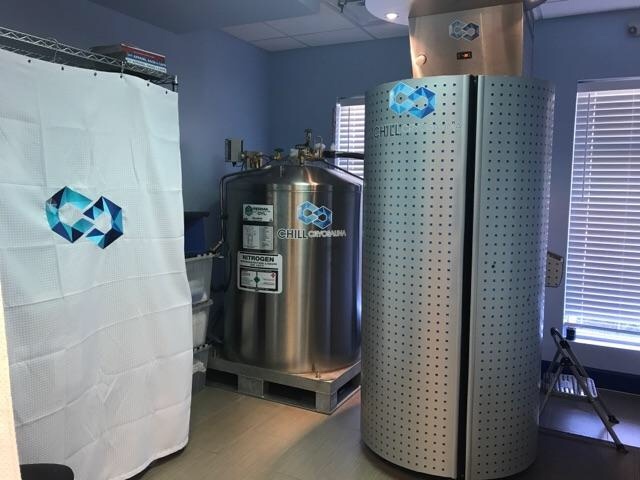 I never heard of Cryotherapy before you and Kerri posted about it. I think it sounds like an interesting experience to try out for sure! I actually really want to try this because of you and Kerri. I've been having the worst hip and knee pain lately, which I think is due to the weather, but who knows... I definitely can use the adrenaline burst!! I think that that as soon as I saw the Beverly Hills housewives trying out cryotherapy I've wanted to give it a try. I'm glad that they do something to try and distract you from how cold it is!